This is a thoroughly enjoyable listen from beginning to end, full of old-school heavy metal aesthetic, burning riffs and soaring vocals. Although a lot of people will probably disagree with me, I think that this album easily surpasses "The Dark Saga". It is catchier, more distinctive and ultimately better. The most noticeable progression in Iced Earth's sound from "The Dark Saga" and from what I have heard of their earlier material, is that the vocals sound much better. 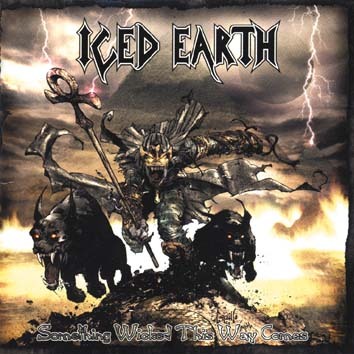 Instead of the punctuated, shouted vocals that they featured in the past, Iced Earth seemed to have expanded on the vocal ideas presented on "I Died For You", the best song from "The Dark Saga". The songs seem to be written more around the lyrics and vocal melodies rather than the riffs. This gives the songs a catchier feel and really gives the vocalist room to shine. That said, this album in nonetheless packed with killer heavy metal riffage, but the songs are more accommodating of the vocals, rather than having them added in as an afterthought. The other aspect that really lifts this album over it's predecessor is the ambitious closing trilogy. Being a sucker for epic, lengthy compositions, this 20+ minute opus really caught my attention. It's engrossing, melodic and heavy, and basically incorporates all the things that Iced Earth do best.